Book Description: Why do advertising campaigns and new products often fail? Why do consumers feel that companies don't understand their needs? Because marketers themselves don't think deeply about consumers' innermost thoughts and feelings. Marketing Metaphoria is a groundbreaking book that reveals how to overcome this "depth deficit" and find the universal drivers of human behavior so vital to a firm's success. 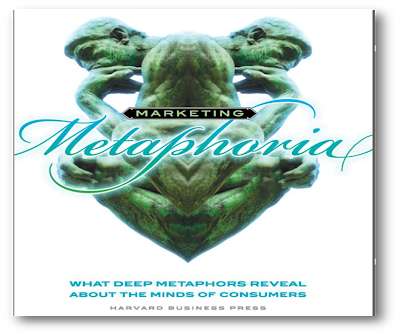 Marketing Metaphoria reveals the powerful unconscious viewing lenses--called "deep metaphors"-- that shape what people think, hear, say, and do. Drawing on thousands of one-on-one interviews in more than thirty countries, Gerald Zaltman and Lindsay Zaltman describe how some of the world's most successful companies as well as small firms, not-for-profits, and social enterprises have successfully leveraged deep metaphors to solve a wide variety of marketing problems. Marketing Metaphoria should convince you that everything consumers think and do is influenced at unconscious levels--and it will give you access to those deeper levels of thinking. "An imaginative and insightful application of cognitive science to the world of business, rich with implications for both fields. "-Steven Pinker, Johnstone Family Professor, Department of Psychology, Harvard University, and author, How the Mind Works and The Stuff of Thought. "Despite the availability of increasingly sophisticated methods, most customer relationships remain standardized, superficial, and lacking in informed customization. Through deep metaphors, the Zaltmans provide an insightful and provocative framework for identifying and learning from the implicit cognitive influences on customer decision making that can enhance and deepen intimacy and loyalty. "-Gary W. Loveman, Chairman, CEO and President, Harrah's Entertainment, Inc.